S.T. Dupont celebrates the bicentenary of Napoleon 1804 coronation with a unique collection of exceptional objects engraved with both the Emperor's profile and his coat of arms: an eagle. S.T. 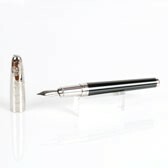 Dupont Napoleon Limited Edition is made up of two Line 2 pocket lighters, one trimmed in gold and the other in platinum, and two Olympio fountain pens, one trimmed in gold and Chinese lacquer and the other in platinum and Chinese lacquer. Each item is numbered from 1 to 1500.